I really did not know what to expect with the keyboard regarding connecting to my Macs and Apple products that I do have or its ability to keep a charge. The keyboard has a built-in solar panel that constantly charges an internal Lithium Ion battery under any indoor or outdoor light source. So working near a window that provides exterior light or with the keyboard on a desk or room light source, this will keep your keyboard battery charged and ready to go. Macally states that they built-in battery will last for over two months even in total darkness. The keyboard contains 110 full size Scissor-key-switch keycaps that provide the user with a sensitive response to the user’s touch. It also contains a 17-key numeric keypad for inserting numbers into your work and 21 preset shortcut keys for one-touch control of Mac applications. I have no issues at all with the keyboard and its ability to keep a charge. The Keyboard comes securely and neatly packaged. I decided to try the keyboard out with all of my Macs: a mid-2011 Mac Mini running Sierra, a 2010 13” MacBook Pro running High Sierra, a 2012 13’ MacBook Pro running Mojave and even my 2009 Mac Pro 5,1 running High Sierra. I had absolutely no issues at all in pairing any of the Macs with the keyboard. The only issue that popped up at the start was when I went to adjust the sound volume, using the F keys, I discovered that the keys did not respond as marked. I wound up having to use the Fn key to have the F9, F10 and F11 keys work as intended. A quick check with Macally techs advised that “Pressing Fn and esc keys will toggle between shortcut mode (volume adjust) and function key mode (F1- F12…) for top row keys will correct the problem.” The one thing I had to remember is that when the keyboard is not used, it will go to sleep to conserve power. Once you tap on a key, the power LED will come on briefly to indicate that the keyboard is now awake. The keyboard charging by LED lamp. Pairing the keyboard with my iPhone or iPad was just as quick and simple. Turn on the keyboard, open up BlueTooth in Settings, select the keyboard and you’re good to go. System requirements: Any Apple computer equipped with Bluetooth; Mac OS X v10.6 and later; light source such as sunlight and/or indoor lighting. The keyboard comes with a one-year warranty. 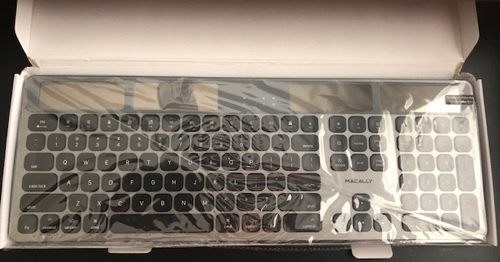 All in all, I give the Macally Solar Powered Rechargeable Slim Bluetooth Keyboard a My Mac rating of 9 out of a possible 10.